Twilio announced earlier this year a plan to offer Twilio Flex, a major new Contact Center as a Service offering into the somewhat crowded market. With SIGNAL, Twilio’s annual Developer and Customer Conference, happening next week we’re bound to hear more exciting news about this new platform. Twilio Flex is not only the latest CCaaS platform to hit the market, it’s unlike anything that’s come before. So what makes Twilio Flex so unique? Flexibility is built into every aspect of the offering. On one end of the Flex stack are the robust, scalable Twilio API’s and services used for millions of voice, SMS, and video transactions each day, and on the other end is Flex UI, a seamless component-based agent experience. What makes Flex so flexible are the unlimited integration points throughout the stack. Leverage Flex out of the box, with only a few configuration settings. 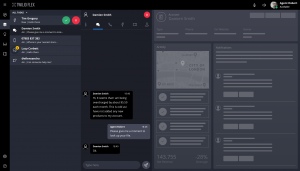 Since every aspect of Twilio Flex is open to integration, companies are finding creative ways to utilize Flex and mold it easily to their contact center vision. My company just recently launched our new pure-cloud platform, DaVinci, which gives customers the ability to create their unique call center experience by configuring a series of Apps from different third parties that can be presented as an embedded agent experience within CRM systems, like Salesforce, Dynamics and SAP C4C. DaVinci helps AMC fulfill our vision of offering customers a single pane of glass CRM and contact center agent experience. It was like Flex was built for this exact purpose. We integrated directly with Flex Manager, so we could leverage all of the channel services and routing capabilities of Flex while focusing on a custom UI with an embedded agent experience for each CRM. Leveraging our DaVinci platform gives users even greater flexibility by allowing them to choose different integration scenarios. For example, a company could use Flex for their contact center, Skype for Business for agent to agent chatting and a different app for SMS handling. We offer Apps for other communication vendors as well, but with Twilio Flex, the job took way less time and has the potential to offer a lot more functionality. Flex will most likely appeal to large enterprises given its incredibly flexible integration model, but even medium-sized businesses will value the out-of-the-box Flex UI and ease of deployment. I believe Twilio’s first major customers for Flex will be those moving from premise communication to cloud – those that just got another forklift upgrade quote from their premise telephony vendor and have the financial incentive to move their contact center into the cloud. System Integrators that become Flex savvy will benefit from this new market as companies push to realize their new contact center vision, especially those that have untethered themselves from their legacy premise solutions. Other companies offering CCaaS are going to struggle to compete with Twilio Flex. 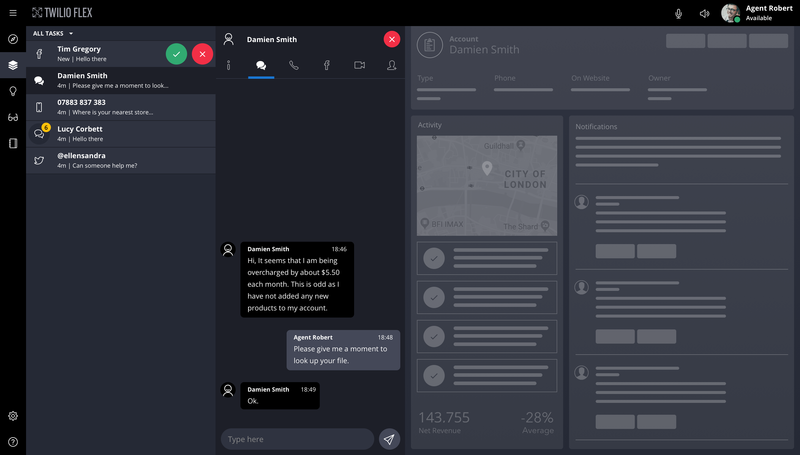 Even with great UI, CRM integration, and robust routing capabilities, none of them compare to Twilio Flex’s openness and flexibility. Twilio will no doubt Flex its muscle in the contact center space. For those able to attend SIGNAL (https://SIGNAL.twilio.com) , I’ll be co-presenting on the topic of CRM Integration with Twilio Flex on Wednesday October 17th, at 3pm ( https://signal.twilio.com/sessions/84RA-JzbEeiHpQpYClWZDA ). Hopefully I’ll see you there. And to find out more about DaVinci, check out https://www.contactcanvas.com/DaVinci.